Firstly I had better introduce myself. My name is Brian Gilchriest and I was a shareholder and director of a prominent top end London based bathroom retail chain. This was sold in 2010 to CP Hart. My official title, back then was business development director with special responsibility for product development and sourcing. I have over 20 year's hands on experience in the bathroom business. I stumbled upon this product and have to be honest here, more by luck. I was in an area at a trade show not linked to bathrooms at all. There was a stand demonstrating the product. I personally paid no attention to all the claims made but did recognise that the water felt soft. I purchased a sample and returned with it to the UK. The model I purchased was the smallest design they sold and I really felt that there was no way this would ever work in the UK. The water exit holes are minute and have a triangular shape. Having, in my life of bathrooms experienced most types of shower heads I was really sceptical about this one. I must say though that using it for the first time I was utterly amazed. ( I probably have at least 3 bar pressure). So what was so good, there seemed an abundance of water that was soft and refreshing, so much so that I just wanted to spend more time showering with it. I personally noticed, after a period of time that my hands felt softer, yes you read correctly. Hair was certainly better but then being a man I do wash it in shower gel and still do. Skin felt softer on shoulders arms and forehead. I set about tracking down the manufacturer and finally visited them in October this year. I will list their claims. 1). Removes residual chlorine from the water supplied via the shower head. 2) Adds Vitamin c and aromatherapy oils and citrus fragrance. 3). Each cartridge contains the vitamin c found in 3000 lemons. 4) Generates 421000 negative ions per cc of water. 5). Saves up to 36,000 litres of water per year. 6). 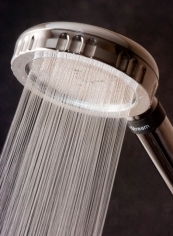 Raises the water pressure 1.5 times higher than a standard shower head. These figures have all been substantiated by test laboratories. The tests were carried out at 1 bar pressure and approximately 9.5 litres per minute flow rate. The head neutralises the chlorine in the water by introducing vitamin c. This certainly effective as I have measured the chlorine in my supply at anything from 0.23ppm to 0.45ppm depending on the time of the year. The measurement taken from water exiting the shower head was around 0.06ppm. I used a Hanna electronic tester. The flow rate being around the 9 l/m. 2). Introduction of Vitamin c and Aroma oils. Yes this is correct, not only can you smell it, you can also experience its benefits on the skin and hair. Cannot quantify this statement apart from the series of lab tests that have been carried out. 4). Negative ions (Lenard effect). These give the feel good factor. That's why we feel refreshed and revitalised around the sea and surf, water falls and rain forests. How many does the head generate. Again unable to quantify this, however your mood does feel heightened both during and after showering. How can water saving be quantified. It has to depend upon the shower head you are comparing it with. What I can say is the head that it replaced in my shower passed at 3 bar 49.3 l/pm. The purastream at 3 bar passes 21 l/pm. Please remember the flow figures are measured by introducing a supply to the head at 3 bar. In the real world the water will be passing through valves pipe work and hoses so the above will never be achieved. It however demonstrates that Purastream can help reduce water usage. Impossible, you cannot raise water pressure by replacing a shower head. What however I believe they are trying to say is that you can experience the effects of raising the water pressure. The tiny triangular holes have the same perceived effect as placing your finger over the end of a tap. As you reduce the spout opening the exiting water appears to exit with more force (pressure) but of course the pressure available at the tap head has not changed. Finally to sum up I can say that with the right water pressure the PuraStream head will deliver a fantastic showering experience that you will not be disappointed with. It works very well with combination boilers, pumped showers, and pressurised water systems. Gravity fed systems can vary immensely with the available pressure but I have had a few friends and family members running it with gravity systems. They have reported a marked improvement in performance when compared to their old shower head. I hope I have attempted to answer honestly. Time will tell but one last piece of useful information is that my previous company directors and partners were so impressed that they have replaced all their shower heads in all their properties with Purastream. Their current company, The Alternative Bathroom Company will be, at this present time the only company directly retailing the product. If you purchase the product I hope you enjoy and experience the benefits as we have.